During the steel production process, workers have to transport large ladles full of molten steel from a blast furnace to a pour station. At the pour station, they must remove the ladle cover and tilt the molten steel into large molds sitting on transfer cars. This process is repeated many times a daily basis. 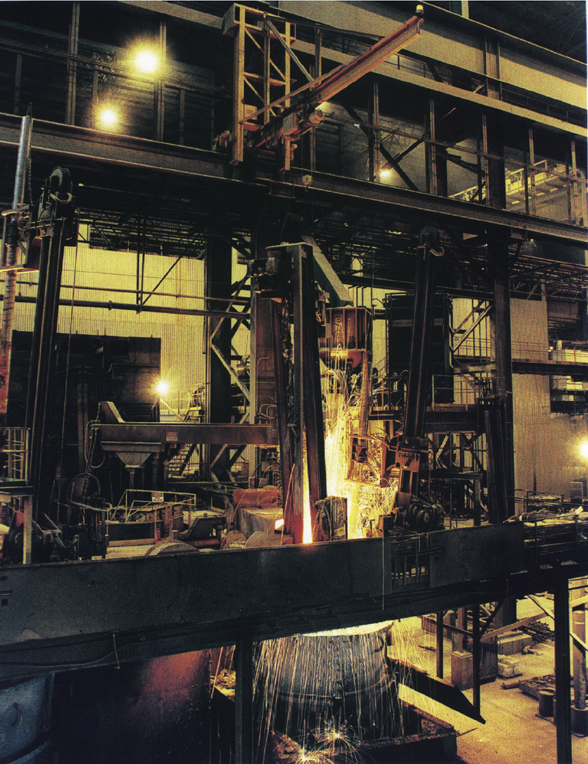 Most steel mills use large, industrial overhead cranes or bridge cranes to move the ladles filled with molten steel, which are extremely heavy. Because the industrial overhead crane is used for lifting the ladles, they can’t be used to lift other materials without causing significant downtime in production. 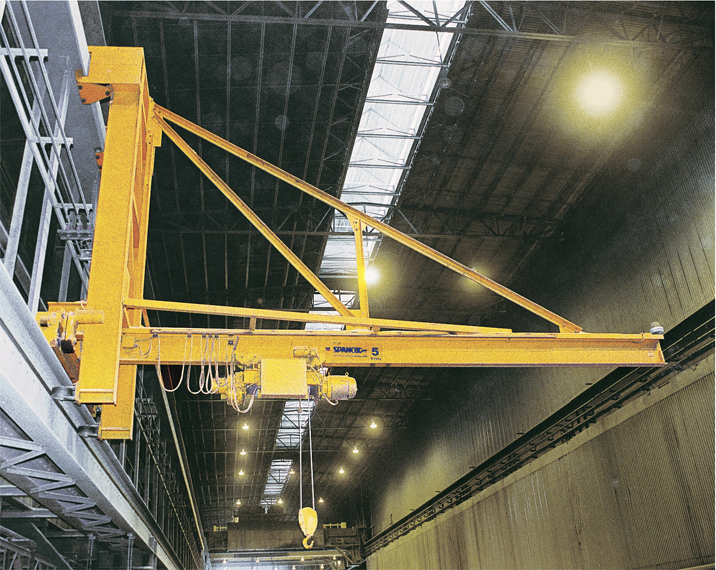 Many steel mills use a wall-traveling jib crane to supplement their larger industrial crane and help with tedious tasks. The jib travels along the wall of their entire facility. For many steel mills, the wall-traveling jib crane is used to lift and remove ladle lids and to transport steel from one end of the facility to another. These wall-traveling jibs are the perfect solution to streamline the production process and allow the industrial overhead cranes to focus on transporting ladles to and from the blast furnace. Wall-traveling jibs are heavy-duty overhead cranes that are designed to lift and transport materials laterally along a production path. What makes them so unique is that they can cover the entire length of a building, and often include custom design specifications to meet the unique needs of a facility. Wall-traveling jibs move along runway tracks, which are mounted on support columns to allow for longitudinal movement. Because they are normally used in conjunction with overhead bridge or industrial cranes, they are generally designated for the frequent movement of smaller loads. Wall-traveling jibs free up the bridge crane for heavier lifts, providing better workflow. But, these jib cranes are also capable of lifting heavy-duty loads, with capacities up to 15 tons. The jib boom can span 40 feet or more, depending on the building’s support structure. Wall-traveling jibs are powered using a squirrel cage motor with a double-reduction spur gear reducer. Squirrel cage induction motors require less maintenance than other types of motorization, and they’re able to operate at a constant speed without overloading. As a split-phase type motor, they’re more efficient and smaller in design, and they also contain more torque. The motor is controlled using a variable frequency drive for multi-speed operation, which provides more control by varying the frequency and voltage supplied to the motor. The motor, like the wall-traveling jib crane itself, is designed for durability and versatility, making it an ideal option for demanding applications like steel mill production. These systems provide a lot of versatility for any facility, but they are especially useful for operations like steel production, which involves multiple functions requiring flexibility and longevity. Oftentimes, production facilities will outfit their work areas with individual wall-mounted jib cranes to ensure there’s less down time for workers waiting to use an overhead crane. For applications with many workstations being used at one time, wall-mounted jib cranes are a great solution. But, there are many plants that require the use of a certain part of the facility for a period of time, before switching to another part. These plants may not require workers to use an overhead crane in each workstation simultaneously, which means they don’t need to purchase and install multiple jibs. One wall-traveling jib crane can cover the entire length of a facility, making them a perfect solution for these kinds of operations.